Philadelphia, PA is an expensive town to buy property. The Philadelphia median home price is $219,600. Properties in Center City, West Philadelphia, or South Philadelphia can net prices upwards of one million dollars. With housing prices so high, it is no wonder that many people look for alternative options to purchase real estate. One such option is the through the Office of the Sheriff of Philadelphia. 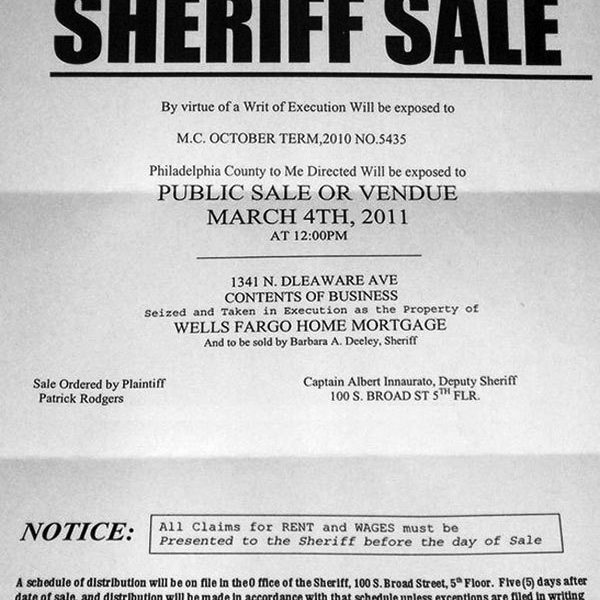 Every month the Philadelphia Sheriffs’ Office holds sheriff sales to auction properties to the public. There are two major types of sales. At mortgage foreclosure sheriff sales properties are being sold where owners have defaulted on their mortgages. At tax lien sheriff sales properties are being sold where owners have defaulted on their taxes. At both sales properties can be had at a hugely discounted rate. Home are regularly purchased at tax lien sheriff sales for between $15,000-$17,000. Sheriff sales can carry massive risks and downside. Homes purchased at a tax lien sheriff sale are subject to a right of redemption. Pursuant to 53 P.S. § 9283, “within nine (9) months of the acknowledgement of the deed, the original owner can redeem the property by paying all back taxes and monies paid by the winning bidder.” To exercise right of redemption; 1.) The property should have been occupied by the same individual or basic family unit; 2.) The property should have been occupied for at least ninety (90) days prior to the date of the sale; and 3,) The original owner must reimburse the buyer of costs. The right of redemption does not apply to mortgage foreclosure sale properties. Right of redemption is not the only lurking risk in buying sheriff sale properties. The prior owner may file for bankruptcy. If the prior owner files for bankruptcy in federal court, then he or she may obtain an injunction stopping any ejectment proceedings. While the success of this tactic depends on case particulars, it can stop a new property owner from successfully ejecting a squatter or former owner from a newly purchased property. Additionally, many properties purchased at sheriff sale have individuals living in them. Even if the persons residing at the property do not exercise their legal rights they must be removed. The legal method by which squatters are removed from a property is called an ejectment. An ejectment is a legal action wherein the owner seeks removal of individuals from their property, asserting they have no legal or equitable right to be there. The Plaintiff must follow specific rules and procedures in filing the ejectment. For example, per Pa.R.C.P. 1054(b) and Wells Fargo Bank, N.A. v. Long, 934 A.2s 76, 78 (Pa Super. 2007), the Plaintiff must attach a copy of the deed to the complaint in ejectment. An ejectment complaint is filed in the Philadelphia Court of Common Pleas. The Pennsylvania Rules of Civil Procedure apply to the filing of all ejectments. After the complaint is filed the squatter has twenty (20) days to respond. If the squatter does not respond a default judgment is entered in favor of the plaintiff. An ejectment often takes four to six months to finalize. Even if you successfully obtain a default judgment, the court may schedule a hearing to verify the authenticity of your deed. You may be obligated to prove the defendant was served with your ejectment claim. You may also be obligated to provide the court with a certified copy of your deed. Following the hearing the court may grant a Writ of Possession. The writ can be taken to the Office of the Sheriff of Philadelphia where a lockout is then scheduled. Another risk to consider in purchasing a home at auction is the condition of the property. Many of the properties sold are unlivable in their current form. It is very difficult to enter and inspect a home before making a bid. Therefore, the property purchased may require massive renovation before it recovers its value as an asset to the purchaser. Buying a property at Philadelphia sheriff sale has huge potential upside. Many real estate investors have become wealthy purchasing properties at hugely discounted prices and then flipping those homes and/or renting them at huge rates of return. Conversely, others have spent substantial amounts of money purchasing properties are sheriff sale only to discover the former owner has filed bankruptcy and/or filed a petition for redemption. If this is the case the purchaser may be forced to wait months or even years to recover the monies paid to the City of Philadelphia for the property. If you are interested in purchasing a property at sheriff sale or filing and ejectment, speak with a Philadelphia Landlord Tenant Lawyer. At the Law Office of Mark D. Copoulos our Philadelphia Real Estate Attorneys can ensure your rights are protected and you maximize your chances of making a sheriff sale purchase a good bet.